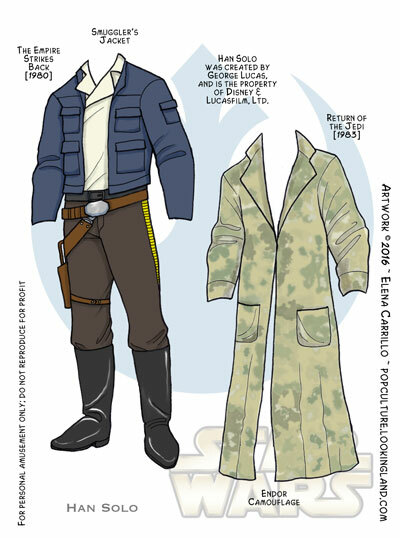 Han Solo’s last plate in this series is his costume from The Empire Strikes Back and his camouflage from Return of the Jedi. 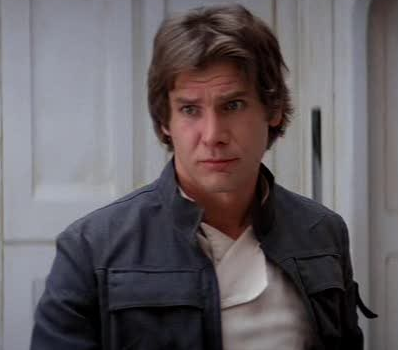 If you’re wondering why he doesn’t have any other clothes from that movie, it’s because he’s still wearing the same thing from The Empire Strikes Back at the beginning of the film when he’s retrieved from the carbonite and then after that, his outfit is pretty much the spitting image of what he wore in A New Hope. There didn’t seem to be any point to reproducing a costume that was so similar. 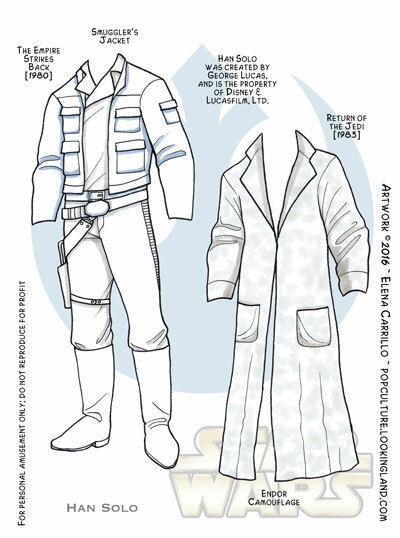 So there you have it: a limited but iconic wardrobe for our favorite space rogue. Posting this plate is kind of a bummer. Though I’ll probably to do a Force Awakens addendum, that just serves as a reminder that poor Han didn’t make it out alive. I continue to feel like the shock of his death has only been dawning on me gradually. Like I have to remember sometimes that he’s dead. I mean, he’s just a fictional character, but he really was larger than life in my childhood. And the fact that he made to a happy ending in Return of the Jedi just put it in my mind long ago that he would live forever. Now I’ll miss him. Maybe it’s just from knowing that we’ve got two more films in this sequel trilogy where his absence will be sorely felt. To see all Star Wars related posts and plates, click the tag or the category at right. Click the Han Solo tag to see all of Han’s plates. Han Solo, Original Trilogy. Bookmark.